Painted fireplace A find on a recent survey. A fine day was had by svbrg members following the Historic trail around Cheddar, led by Sue & Paddy. Starting with lunch at the Bath Arms Hotel, we followed the winding back streets and were able to access a number of properties not normally open to the public. One of the sites in the school grounds, see photo, has the archaeological markers of an Anglo Saxon hall. Concrete pad stones indicating the former positions of earth fast posts. Interestingly a reconstruction of the hall has recently been built at the Avalon Marshes Centre. The earth fast posts found in the dry chalk of Cheddar have been duplicated in the wet peat of Shapwick. Clearly someone needs to learn why different vernacular styles occur. 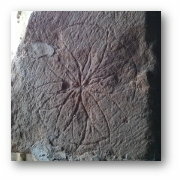 Ritual Protection Marks, or Witch marks in historic Vernacular Buildings. It is unusual to find a standing building that pre dates the C14th hence we can only note that ritual protection has taken place for centuries, even into pre history. Indeed we still do it now - horse shoes nailed above or primroses or garlic near the entry door. Ritual deposits in vernacular buildings. 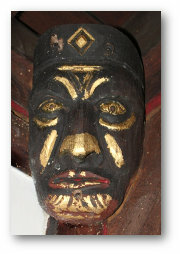 During his SVBRG lecture Julian referred to the "African Masks" in St. Johns Church, Yeovil. Here are a few images taken when the scaffold was up for restoration. Adjacent house surveyed, jointed cruck photos added. A most interesting house with canted bay and kneeler stones, painted wall decoration and witch marks. 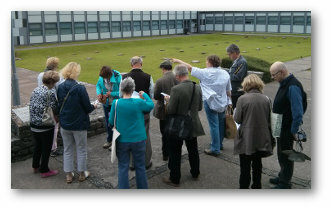 A selection of photos are included here, members can request the full report for more details. 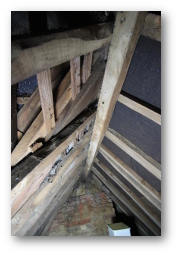 A Dendrochronology Project (tree-ring-dating) was undertaken during 1996 -1998 which enabled a chronology to be established of the seven principal roof types found in Somerset. The Project also established that the precise date of many medieval houses is much earlier than had previously been thought. A second Project started in 2003 with the aim of expanding and consolidating the earlier findings. The projects are funded by generous grants from a number of sources. The Fairfield House tree ring data referenced in our newsletter can be found here. Level marks on a smoke blackend jointed cruck. A few pictures from our December survey. Decoding the house history proved very challenging as nothing was as it first seemed. A selection of photos are included here. See the hard copy report for more details. Historic England have updated their pdf guide to recording buildings, "A Guide to Good Recording Practice"